Garver Project Manager Colin Bible and Senior Planner Karon Wiedemann join Terrell Municipal Airport personnel at the 2014 Texas Aviation Conference. 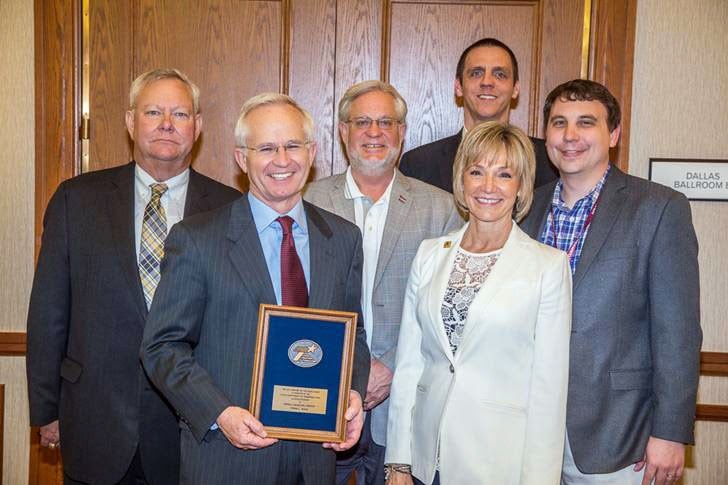 The Texas Department of Transportation Aviation Division recently recognized Terrell Municipal Airport in Terrell, Texas as the 2014 TxDOT General Aviation Airport of the Year. 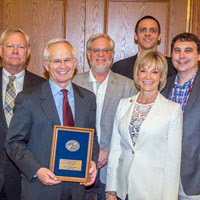 The award reflects the airport’s importance to the air transportation system and the region it serves, according to the Texas Aviation Conference website. “It is an honor to be recognized for years of hard work,” Terrell Assistant City Manager Mike Sims told the Terrell Tribune. “Through their grant and regulatory programs, TxDOT has a thorough knowledge of every airport in the state." Garver is currently working on a 12-bay T-hangar project at Terrell Municipal Airport and will begin a flood plain and drainage study at the airport this summer.